COSMO-12 will be held at Beijing, China. 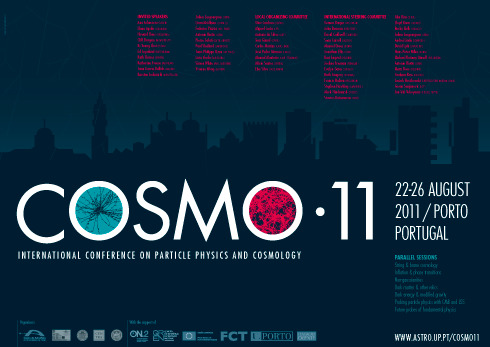 The fifteenth edition of the annual International Conference on Particle Physics and Cosmology - COSMO 11 - will be held in Porto (often known to foreigners as Oporto), in the week of August 22-26, 2011. The conference will take place at the Campo Alegre campus of the University of Porto. Starting as a workshop in Ambleside in 1997, COSMO meetings rapidly became the key forum where particle physicists, cosmologists and astrophysicists worldwide meet and exchange ideas in one of the most active areas in physics. The meetings typically attract more than two hundred researchers. The conference will be devoted to the new and exciting interfaces between Fundamental and Phenomenological Particle Physics and Physical Cosmology and Astronomy. COSMO 11 will be followed by an observational cosmology summer school in the Azores Islands.